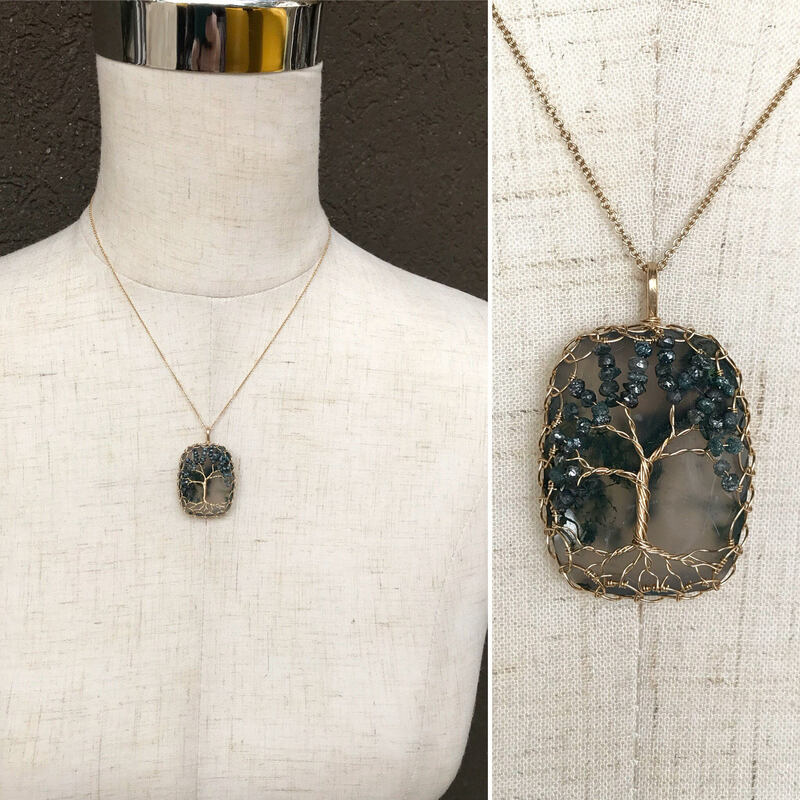 Tree Of Life Necklace - Solid 14k Yellow Gold - Cushion Cut Faceted Moss Agate - Genuine Blue Diamond Leaves - "Everlasting Oak"
One of a kind solid 14k gold tree of life necklace on a stunning rectangular cushion cut moss agate stone with genuine blue diamond leaves. Dangling from a solid 14k gold cable chain. 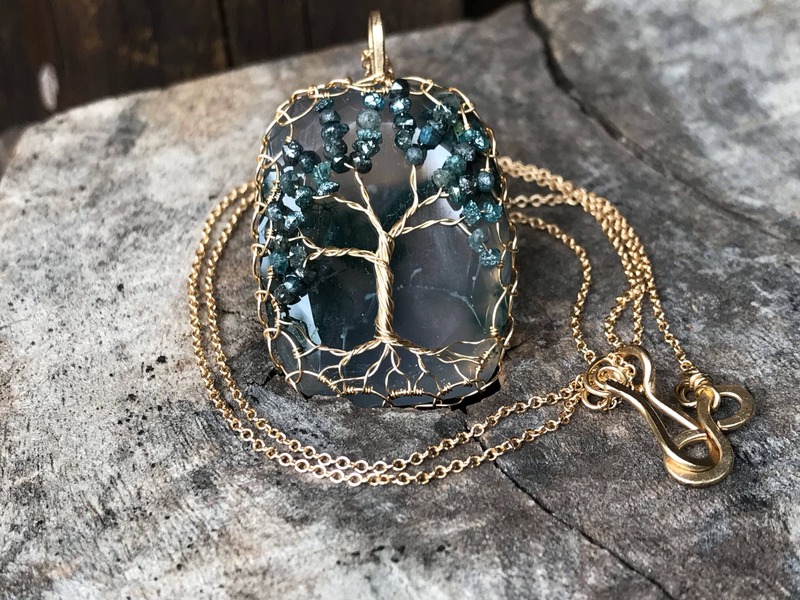 The oak tree has long been a symbol of strength, endurance, wisdom and nobility, highly revered for it's size and longevity as well as the abundant gifts it has provided over the centuries. 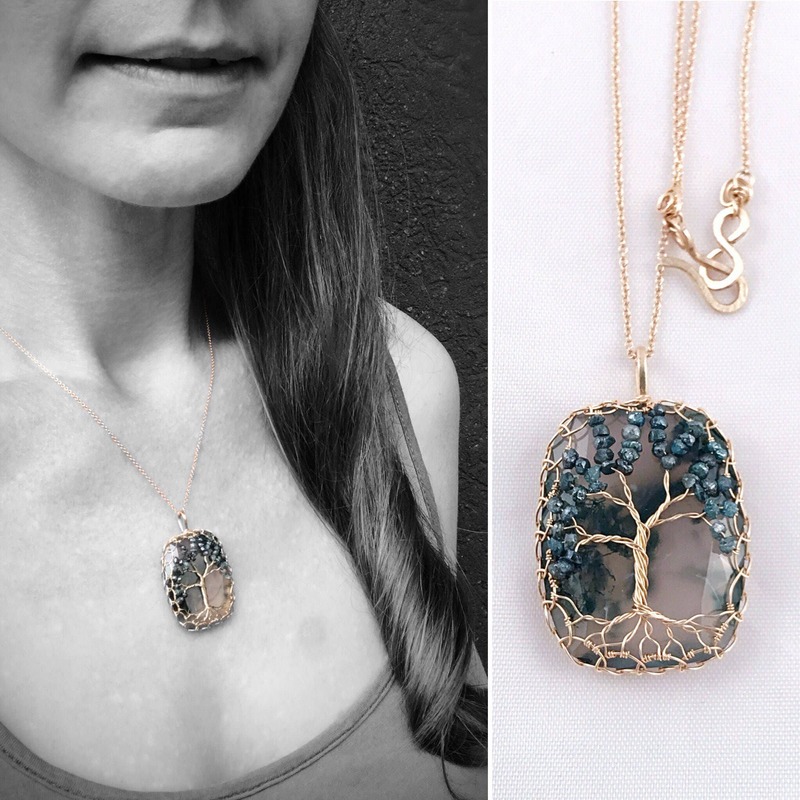 This tree, created in solid gold and blue diamonds, is truly an "Everlasting Oak." 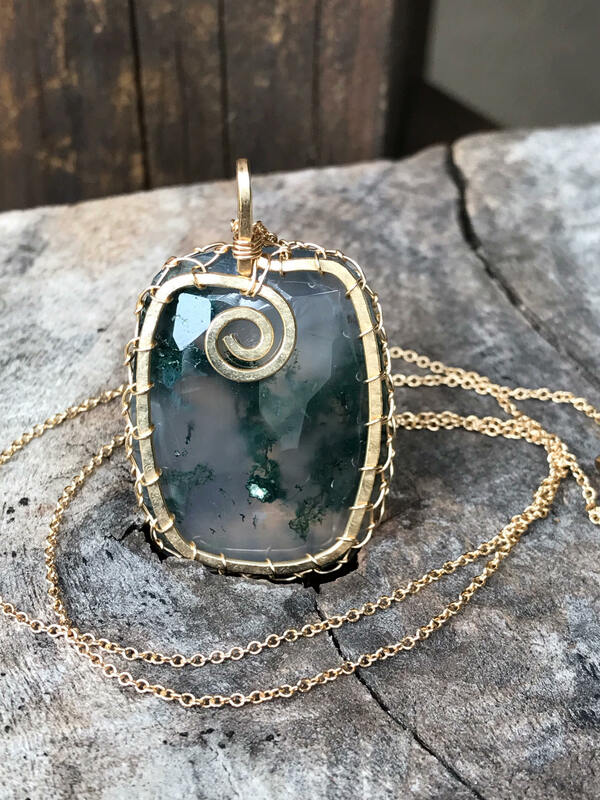 This gorgeous moss agate stone is cushion faceted on the sides, rose cut faceted on the back and set on a hammered solid 14k gold rounded rectangle backing with spiral detail and mounted in a very secure woven solid 14k gold bezel which flows beautifully into the tree design on the front of the stone. Diamonds are the most well known symbol of "forever". 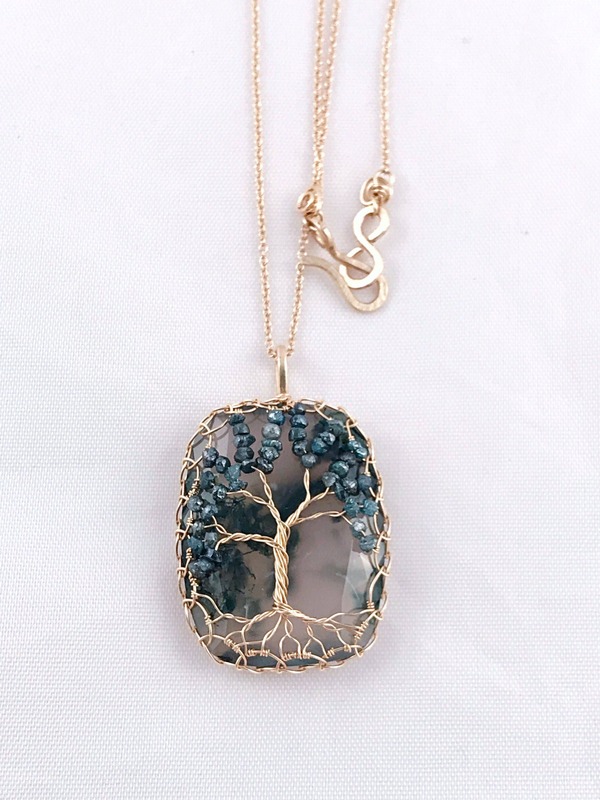 The leaves of this tree are genuine conflict free blue diamonds (color enhanced). 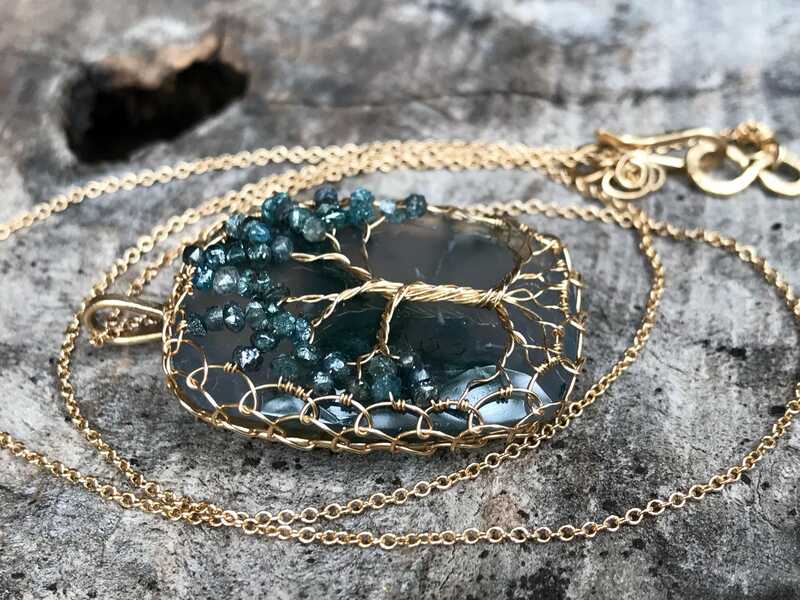 Their color is a greenish-teal blue that perfectly compliments the mossy inclusions of the agate. 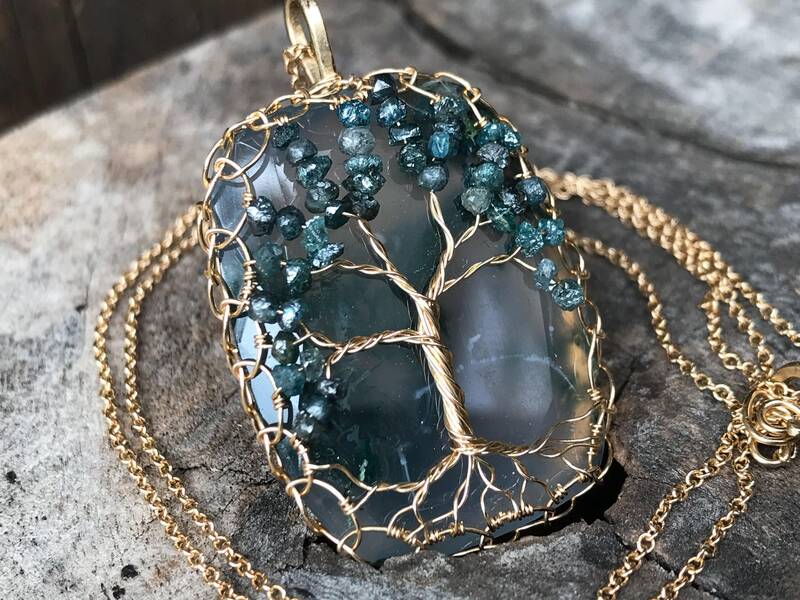 44 of them adorn the branches of this tree, sparkling and shimmering in a truly magical way. -Pendant measures 31mm (just under 1 1/4") tall (not including the top loop which adds about 1/4"), 24mm (just under 1") wide, and 8mm (5/16") deep. 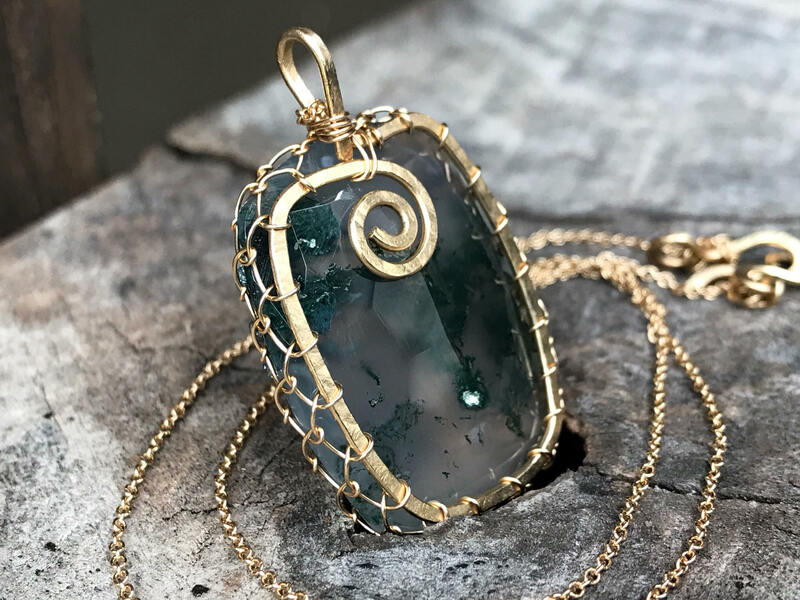 -The stone is a genuine natural rounded rectangle cushion cut moss agate. It is translucent (light can pass through) and showing gorgeous green mossy inclusions. -44 Genuine rough teal blue color enhanced conflict free diamonds adorn the design as shimmering leaves. -All of the wire is solid 14k yellow gold, formed and shaped by hand. -Chain is a solid 14k yellow gold 1.1mm width 18" length cable chain with a hammered 14k gold hook and loop clasp. It looks delicate but is quite strong. -If you would like a chain length other than 18" or an alternate clasp option, please message me. 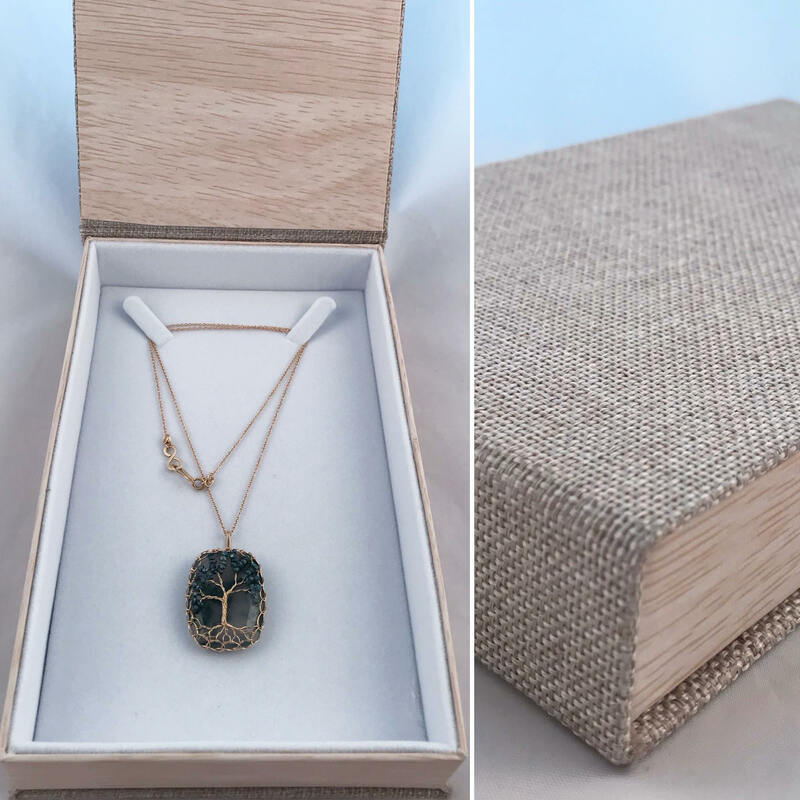 -This necklace will arrive to you packaged in a beautiful wood and burlap gift box, with a signed certificate of authenticity. Perfect for giving to that special someone, or keeping for that special you! It will ship with insurance for the full value of the necklace. 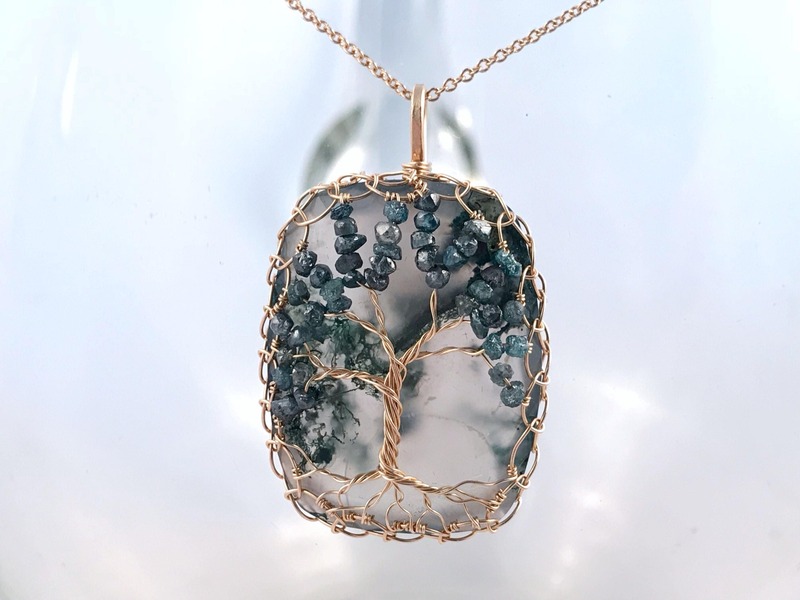 -Each of my Tree of Life necklaces are one of a kind, no two are ever the same. I absolutely love creating these and watching them take form. They always amaze and delight me with their unique personalities when they're completed.